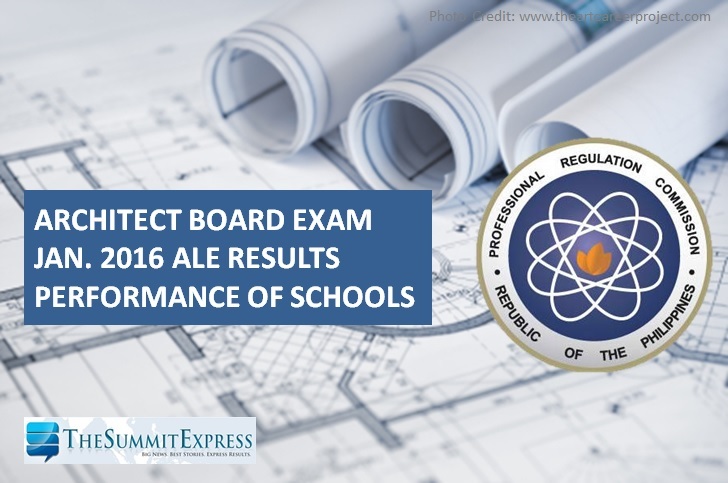 The Professional Regulation Commission (PRC) officially announced on Friday, February 5, 2016 that 866 out of 1,556 (55.66) passed the Architect board exam (ALE) given by the Board of Architecture headed by its Chairman, Arch. Robert S. Sac with two other members, Arch. Fidel Jose R. Siapno and Arch. Robert M. Mirafuente. The examination was held in Manila, Cebu and Legazpi last January 29 and 31, 2016. PRC named University of Santo Tomas (UST) as the top performing school in the January 2016 Architect Licensure Examination as per Commission Resolution No. 2010-547 series of 2010. UST has 167 out of 194 (86.08 % ) takers who have passed the exam.